Where to Find: Merrick Pet Care, Inc.
dog’s bowl, and more importantly, in your dog. Earlier this summer, I was contacted about the Merrick Food Revolution and asked if we would be interested in checking it out. Merrick is already well known in the Lapdog household, as we use their canned food, so of course I said yes. Besides, the Lapdogs would never let me pass up an opportunity like this! All four eat dry kibble with a mix-in for dinner, which varies between high quality canned food such as Merrick's, yogurt, cottage cheese, veggies and fruits.. I was thrilled to have the chance to check out more of their line, including the all new grain free kibble! A couple months after we were first contacted, we received an amazing Revolution Launch Kit! Inside the box we found six sample bags of kibble (three classic recipes, three grain free), two cans of food, a Petite Round Le Creuset bowl (which Mama claimed after our photo shoot), a wooden spoon, and enough bandanas for all four Lapdogs. There was also some great background information and literature on Merrick and the Food Revolution included. Local growers: Ingredients are grown by American farmers and ranchers, not only to support local communities, but also to ensure freshness and food safety. This is of utmost importance to this doggy Mama, especially with all the issues of food and treats from China. Nutritious real whole foods: Food is used in its purest state — with no artificial additives, sweeteners, colorings or preservatives. This means it is pure, delicious and nutritious. What more could a Mom ask for? Cooked in Merrick’s own kitchens: A true "from our kitchen to yours" statement. Merrick cooks food in small batches in its kitchens in Hereford, Texas — which means cooking and quality control is under one roof. With recent dog food recalls from the bigger manufactoring plants, this is also an increasingly important issue. Balanced nutrition: The balance of porteins, fruits, veggies and whole grains forms a superior nutritional experience for your dog. Grain-free varities, designed for dogs who have food allergies or sensitivities, are also available and contain no wheat, rice or other grains. Health you can see: Since the adage “you are what you eat” applies to both people and pets, Merrick uses industry-leading levels of protein and healthy fats to ensure dogs’ optimal weight and energy; fatty acids for healthy skin and coat; glucosamine and chondroitin for healthy bones and joints; and highly digestible meat proteins, peas, apples and blueberries for improved digestion. We've always used Merrick's canned food because, in part, of the wide variety of flavors available. I've yet to see such extensive flavor options with any other dog food line. 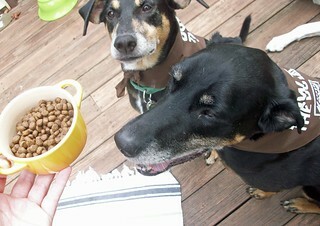 Currently, Merrick offers dry kibble in seven classic recipes, as well as four grain free recipes. Their canned food is available in fourteen classic recipes (plus additional toy/small breed formulas), as well as six grain free recipes. Talk about variety! The only thing I personally see missing right now is a fish recipe. I know dogs who have allergies to chicken and beef, and I have recently switched two of the Lapdogs to a fish formula kibble to see if it alleviates some of their seasonal allergies. I'd love to see Merrick add a fish formula in the future, especially since their foods are so readily available at almost all feed stores in my area. In the meantime, I will continue to use Merrick canned food on a regular basis and if I find the need to switch kibble in the future, will certainly consider one of the new grain free options. I was thrilled to see they have a buffalo recipe, which is something Zeus and Lola really love. 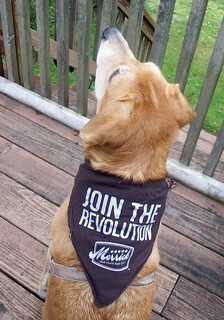 Check out Merrick foods for your dog and hop on the Food Revolution today! You can follow them on their Facebook page, as well as on Twitter for special offers and coupons. Disclosure: The Merrick Revolution kit was sent to Lapdog Creations for review, FREE. I was not compensated for this review. All opinions expressed are my own. Great review! I had to stop by and see that awesome sampler pack you got! I love the bandannas! Sounds good. I, too wish there was a fish recipe. Samba eats only fish and the others all like it. The pack loos adorable in their bandanas. Like their philosophy... wish they'd do a Sissy-friendly formula.